Lycopene (from the New Latin word lycopersicum, referring to the tomato species) is a bright red carotene and carotenoid pigment and phytochemical found in tomatoes and other red fruits and vegetables, such as red carrots, red bell peppers, watermelons, gac, and papayas (but not strawberries or cherries). Although lycopene is chemically a carotene, it has no vitamin A activity. Foods that are not red may contain lycopene as well. In plants, algae, and other photosynthetic organisms, lycopene is an important intermediate in the biosynthesis of many carotenoids, including beta carotene, responsible for yellow, orange or red pigmentation, photosynthesis, and photo-protection. Like all carotenoids, lycopene is a polyunsaturated hydrocarbon (an unsubstituted alkene). Structurally, it is a tetraterpene assembled from eight isoprene units, composed entirely of carbon and hydrogen, and is insoluble in water. 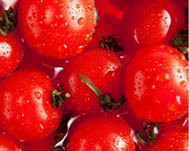 Lycopene's eleven conjugated double bonds give it its deep red color and are responsible for its antioxidant activity. Due to its strong color and non-toxicity, lycopene is a useful food coloring (registered as E160d) and is approved for usage in the USA, Australia and New Zealand (registered as 160d) and the EU. Because preliminary research has shown that people who consume tomatoes have a lower cancer risk, lycopene has been considered a potential agent for prevention of some types of cancers, particularly prostate cancer. However, this area of research and the relationship with prostate cancer have been deemed insufficient of evidence for health claim approval by the US Food and Drug Administration (see below under Antioxidant properties and potential health benefits). Plants and photosynthetic bacteria naturally produce all-trans lycopene, but a total of 72 geometric isomers of the molecule are sterically possible. When exposed to light or heat, lycopene can undergo isomerization to any of a number of these cis-isomers, which have a bent rather than linear shape. Different isomers were shown to have different stabilities due to their molecular energy (highest stability: 5-cis ≥ all-trans ≥ 9-cis ≥ 13-cis > 15-cis > 7-cis > 11-cis: lowest). In the human bloodstream, various cis-isomers constitute more than 60% of the total lycopene concentration, but the biological effects of individual isomers have not been investigated.